One of the things I love to do to de-stress is gaming. 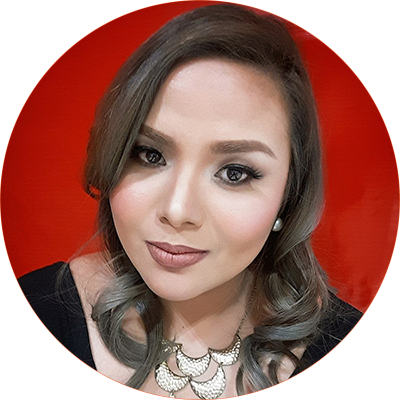 I'm glamazon tita with an appreciation for beautiful graphics, strategy, RPGs, and MOBAs. I grew up with gamer bros and to this day, I really still like immersing myself in games to unwind. I'm currently obsessed with Mobile Legends and I like how this MOBA mobile game reminds of me of my DotA days spent with friends. This time, I get to enjoy it on my phone and I can even bind it to my FB account so I can play with friends! I also play Everwing with when the mood strikes me but ML is my absolute favorite. I don't know if you've ever experienced this, but I really hate it when I have poor WIFI connection during gaming. I get that lag that causes slow to zero response rate for my hero and I actually get reported for going AFK during the battle because my hero is either standing still or running around in circles the whole time. I've learned that using reliable mobile data not only gives me the experience I want but it also lets me play even when I'm not hooked to the WIFI at home. Smart has great news for us gamers! Let me tell you about the Smart Prepaid Gametime because you get the best bang for your buck with this promo. For only 50 pesos, you get 7 days of gaming. You can play Mobile Legends, Everwing, Clash of Clans, Clash Royale, and Arena of Valor without worrying about lagging and consuming all of your data. You get 300MB per day and if you play Mobile Legends, you get free 50 Battle Tickets to use in your game. This essentially means faster game time, no buffer time, and you can get your ML fix anytime, anywhere. 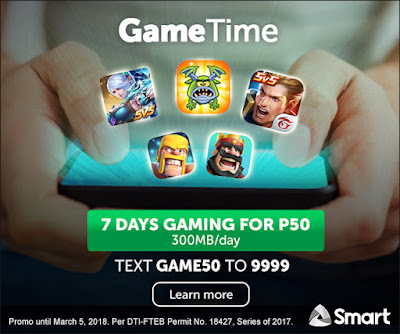 You can also get the Gametime Promo for 100 pesos which gives you 30 days game time for Mobile Legends, Everwing, Clash of Clans, and Clash Royale and 100 ML Battle tickets. For the Game Time 50 (Hero Offer), simply text GAME50 to 9999 and for the Game Time 100, text GAME100 to 9999. You get 300MB per day when you avail of this promo and you get free Mobile Legends Battle Tickets too. I don't know about you, but I'm definitely trying it for tonight's game night with hubby. No more wet noodle experience for tonight's battle! Thanks for visiting! This is your Glamtech, signing off to load up for tonight's game night!